Editor, translator (books of early Hindi & Punjabi mystic poetry), Resonance Repatterning practitioner... Enjoys tinkering with soil improvement, water management, composting and planting fruit & evergreen trees. To hear Clayton Nolte himself, answering questions on what structured water is and how these CN biophotonic water structuring devices work, click here. And here is Victoria White, long-time user of structured water and interviewer of Clayton Nolte, speaking about structured water. You may find drinking biophotonic structured water is the most valuable health insurance you have ever invested in! ~ $2.75 a day for one year only for a basic Whole House structured water unit that is lifetime guaranteedHere’s to the very good health of you and everyone who drinks water at your home! 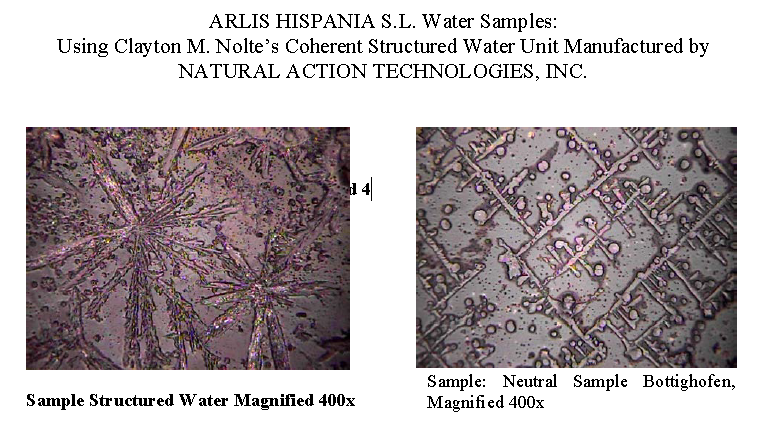 A company in Spain (Arlis Hispania SL) asked a professional laboratory in Germany (Hagalis Laboratory) to conduct a crystallization analysis of two water samples: ordinary (‘neutral’) tap water, and the same type of water run through a Clayton Nolte water structuring device. ONLY TO BE FOUND IN HIGH-QUALITY NATURAL SPRING WATER. 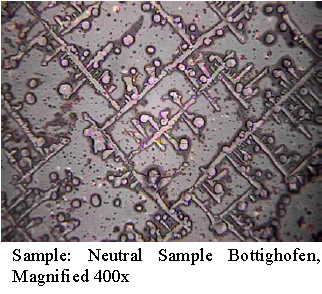 The ‘neutral’ sample (tap water) shows a lot of 90-degree angle structures. There are none in the CNS Water sample. This means the structuring process has neutralized the toxic substances present in the tap water. 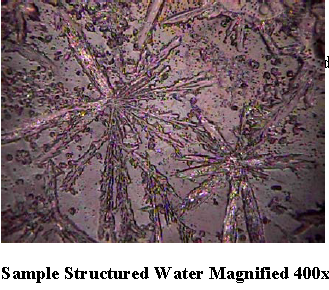 CNS Water sample shows star-shaped 60-degree angle structures associated with ‘Good to Very Good’ spring water quality. Crystals in ‘neutral’ sample were heavily compacted, associated (among other things) with deposits of lime and other minerals. 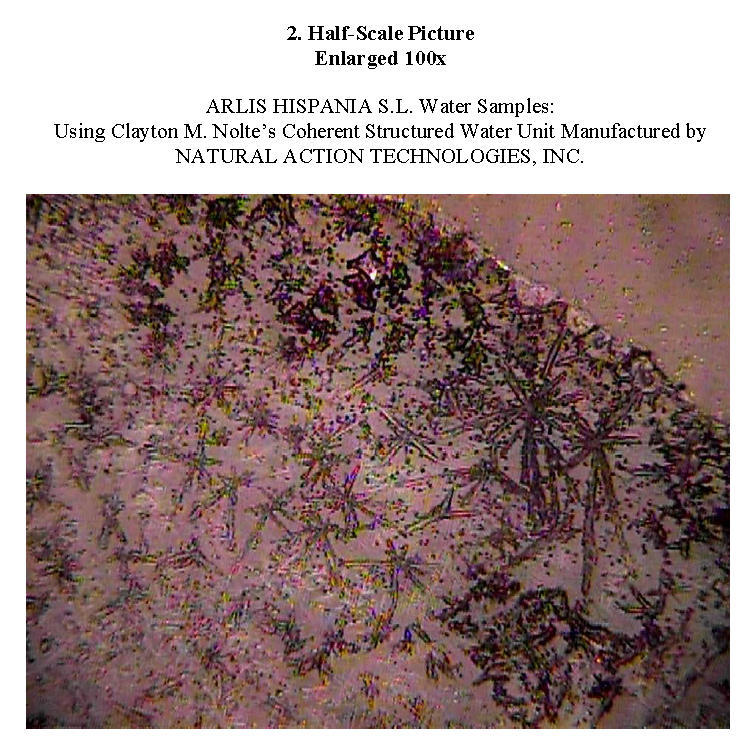 CNS Water sample shows hardly any compacted areas, and the small crystals that do appear are “less prone to precipitation”. “Technical equipment operates perfectly using this quality of water,” a major factor for maintenance and durability of any devices using water, including water pipes in the home, coolers, water heaters, kitchen equipment etc. The surface formation of the crystals in the CNS Water sample has increased sharply, indicating an increase in the availability of the minerals for human absorption. 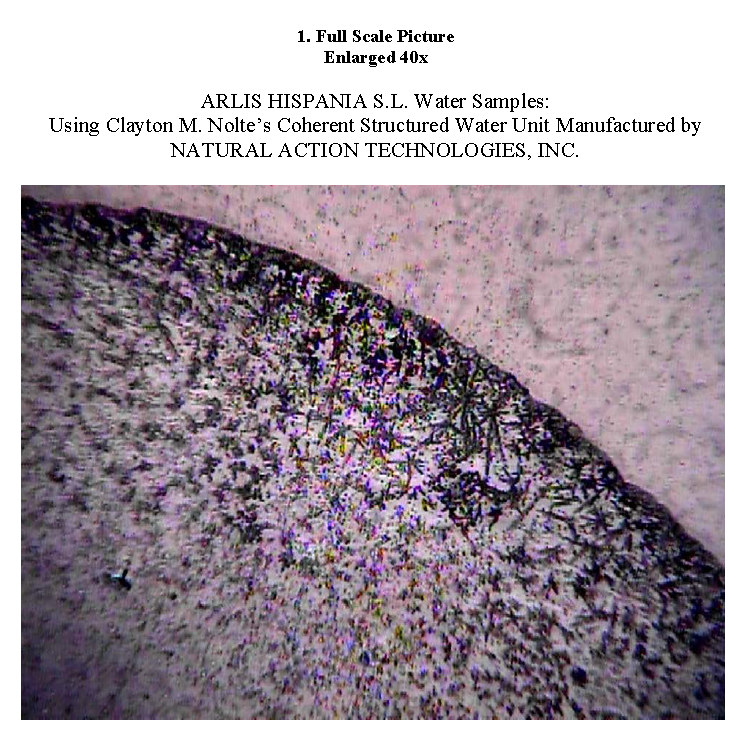 p.1: Analysis was done on chrystallized material from the liquid and solid state of the 2 samples, resulting in chrystallization pictures (see end of the report) that show recognizable characteristics associated with various types of water – for example, spring water, water that is polluted, etc. Organic methods or structured water? Life-enhancing, photon-filled water…from your tap! Is it possible to differentiate the effect of a green thumb and organic soil amendments from the effect of CN structured water? Yes! What is fascinating on Victoria White’s land are the organic trees that are NOT as big as her other trees. All the trees were planted in January 2008, have received the same organic soil treatments since then, the same drip water irrigation, the same ‘green thumb’ effect and the same lack of any pruning. So why are some trees smaller, more immature and less productive? It turns out they were put on structured water about 8 months after the other trees! Thanks to a quirk of Victoria’s garden budget, the almond trees on her property in August 2010 provide an objective way to differentiate how much credit for the tree size and productivity is due to Victoria’s in-depth organic gardening techniques and green thumb (used equally on all the trees) and how much is due to structured water ~ which was introduced directly into the garden in two distinct phases, the first in August 2009 and the second about 8 months later, in the Spring of 2010. It will be interesting to see next year, in August 2011, whether the smaller trees have caught up with the larger trees after another year on structured water. The trunk size especially is a helpful benchmark in comparing the trees. As can be seen below, there are three types of almond, identified as A1, A2 and A3. In August 2010, all three types of almond trees on non-structured water range from 5″ to 6.5″ trunks; the three types on structured water range from 9″ to 10.5″ trunks. That is a significant difference in growth and rate of maturity, any way you look at it! Note: When structured water flows down a straight pipe for more than 300 feet, it loses its structure, becoming unstructured. PHOTO GALLERY All pictures taken by Victoria White 12-13 August 2010. Click on image to enlarge. Question for Victoria: is this tree A1, A2 or A3? Question for Victoria: this looks like the same tree as above? It is ~ AG now has the correct photo & will upload soon! again, beyond 300′ so it started to receive structured water only in Spring 2010.
so far (Aug 2010) showing no sign of ants. Wow! If you got this far – thanks for visiting! We’ll be upgrading this website in May/June.